These candles are created with a solid black center and then hand grubbed and dripped with my own Garveyard Wax. This midnight blue wax contains AUTHENTIC earth from a graveyard and crossroads. The graveyard earth was collected from the graves of 5 children whom I am very close to. Children are considered neutral as they do not possess the experiences adults have had to shape or mold their spirit or energy. This earth is wonderful for adding power to workings. The crossroads earth will evoke the power of deities such as Elegua and Hecate. They will help provide guidance about decisions ahead and can change the path of your fate and fortune of you've had a spell of bad luck. These candles also contain cedar oil, clove powder, mugwort, mullein, and patchouli. These herbs thin the veil and enhance connection with spirits and the divine. I LOVE these! 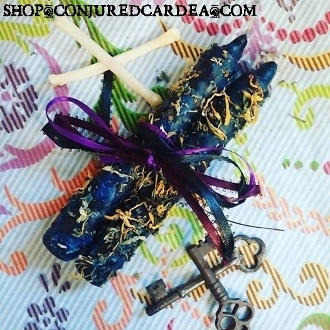 And not just because I created them:) These are AWESOME for that midnight worship, invocation or evocation you've been waiting to do! PERFECT for Samhain! I have made this a set of two for convenience and aesthetics when setting up your altar and place of worship.